At the community activities page you can read news items for the teachers’ community and the newsletters that were send out to the teachers. If you have any news that would be interesting for the Inventing Europe teaching community, please contact us. Since April 2015 Inventing Europe is involved in a European Commission sponsored project led by our partner Europeana: the CEF project. Together with Europeana we work on the improvement and firmer integration of the re-use of digital cultural heritage materials in university education. Today we share with you a special issue of the Tensions of Europe newsletter that updates you on these education related activities. Read all about the launch and improvement of our “What’s like this?” section that can be found below each of the stories in each of our tours, read the blog by Jan Korsten on the importance of Education for Europe, and join the challenge. The newsletter can be found here. Getting youngsters excited about European history and helping them develop a sense of historical awareness can be challenging. How do we help them actively understand why historical knowledge is important, and encourage them to discover the roots of today’s society? To answer these questions, the Foundation for the History of Technology (SHT) explores new and innovative ways of making historians’ research suitable for the classroom. “Europe’s Infrastructure in Transition: Economy, War, Nature”, the fourth volume of Making Europe: Technology and Transformations, 1850-2000, is now available. The authors of the book, Per Högselius (KTH Royal Institute of Technology, Sweden), Arne Kaijser (KTH Royal Institute of Technology, Sweden), and Erik van der Vleuten (Eindhoven University of Technology / Foundation for the History of Technology, the Netherlands), analyze how Europe’s infrastructure both united and divided peoples and places via economic systems, crises, and wars. Some used transport, communication, and energy infrastructure to supply food, power, industrial products, credit, and unprecedented wealth; others mobilized infrastructure capacities for waging war on scale hitherto unknown. Europe’s natural world was fundamentally transformed; its landscapes, waterscapes, and airspaces turned into infrastructure themselves. The book reframes the conflicted story of modern European history by taking material networks as its point of departure. It trances the priorities set and the choices made in constructing transnational infrastructure connections – within and beyond the continent. Order your volume here. Go to www.makingeurope.eu for more information about the book series. 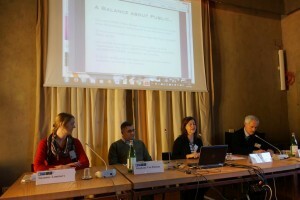 Inventing Europe participated in the Public History and the Media Workshop that took place at the European University Institute in Florence, Italy, 11-13 February 2015. The workshop tried to answer the question what public history is, the question of audiences, and how exactly to define the difference with the traditional history field. Many projects, digital and non-digital were discussed, which allowed the examination of the impact of digital developments on being able to do public history and communicate with previously inaccessible audiences. A fruitful workshop in a beautiful environment, where Inventing Europe was invited by Serge Noiret. The Inventing Europe presentation discussed the ways in which university teachers from all across Europe use the website in their classrooms. What are the advantages and challenges of teaching history with a digital medium? As a starter presenter Suzanne pondered on her own history lessons at university and high-school, especially on the role of the concepts of “technology” and of “Europe”. Inventing Europe tells this new perspective on European history that people in their daily lives can relate with, and opens up this perspective to students of a broad range of studies. “Writing the Rules for Europe. Experts, Cartels, and International Organizations”, the third volume of Making Europe: Technology and Transformations, 1850-2000, is now available. The authors of the book, Wolfram Kaiser (University of Portsmouth, UK) and Johan Schot (SPRU – Science Policy Research Unit, University of Sussex, UK / Foundation for the History of Technology, the Netherlands), analyze how experts, cartels and international organizations have written the rules for Europe since around 1850. Based on fresh research in the archives of multiple international organizations and European countries it explores the “hidden integration” of Europe – forms of integration that were not always visible, but affected the citizens of Europe in their everyday lives. Richly illustrated and engagingly written, the book de-centers the present-day European Union in a new long-term understanding of European integration. Order your volume here. Go to www.makingeurope.eu for more information about the book series. A new anthology “Migrating Heritage” edited by Perla Innocenti of the University of Glasgow has recently been published, including a chapter about Inventing Europe (Alexander Badenoch, “Translating objects, transnationalizing collections: Inventing Europe between museums and researchers”). The book is one of many important outputs by the MeLa project, of which IE has long been a keen observer – and now in a small capacity, honored contributor. Bringing together an international forum of experts, this book looks at how museums, libraries and further public cultural institutions respond to the effects of globalisation, mobility and migration across Europe. It puts forward examples of innovative practice and policies that reflect these challenges, looking at issues such as how cultural institutions present themselves to and interact with multicultural audiences, how to support networking across European institutions, and share practice in core activities such as archiving interpreting and exhibiting artefacts. Academics, practitioners from museums and public institutions and policymakers explore theoretical and practical approaches from a range of different disciplines such as museum and cultural heritage studies, cultural memory studies, social anthropology, sociology of organizations, cultural heritage management and cultural heritage informatics. Order your copy here. The second book of the Making Europe book series ‘Building Europe on Expertise. Innovators, Organizers, Networkers’ by Martin Kohlrausch and Helmuth Trischler is now available. Focusing on experts in technology and science, Building Europe on Expertise delivers a new reading of European history. The authors show that modern Europe was built by experts using their unique knowledge to shape societies, set political agendas, and establish collaborations which proved decisive in integrating the Continent. You can order this volume here. For more information on the Making Europe book series go to the Making Europe website. The first volume of the Making Europe book series ‘Consumers, Tinkerers, Rebels. The People Who Shaped Europe’ by Ruth Oldenziel and Mikael Hård is out now. Certainly inventors, engineers, and politicians played their parts. But in the making of Europe, consumers, tinkerers, and rebels were an unrecognized force—until now. In this book, historians Ruth Oldenziel and Mikael Hård spotlight the people who “made” Europe—by appropriating technology, protesting for and against it. Order your copy at Palgrave. For more information on the Making Europe book series go to the Making Europe website. Former Inventing Europe main editor Alexander Badenboch has published his article ‘Harmonized Spaces, Dissonant Objects, Inventing Europe? Mobilizing Digital Heritage’ in the journal Culture Unbound. Abstract: Technology, particularly digitization and the online availability of cultural heritage collections, provides new possibilities for creating new forms of ‘European cultural heritage’. This essay analyzes the emerging sphere of European digital heritage as a project of technological harmonization. Drawing on Andrew Barry’s concepts of technological zones, it examines the various ways in which agency and European citizenship are being reconfigured around cultural heritage. It explores the “Europeanization” of digital heritage in three areas. In the first section, it analyzes the recent agenda for digital heritage of the European Union as a harmonizing project to create a smooth space of cultural heritage. In the next sections, the development of a harmonized virtual exhibit on the history of technology in Europe forms a case study to explore processes of harmonization at the level of the web platform, and in the aesthetics of digitized objects. It argues that rather than seeking to elide the points of unevenness and ‘dissonance’ that emerge in harmonization processes, we should instead look for ways to embrace them as points of dialogue and discovery.